Modernize any space with this wood planter stand. Featuring a rounded construction design with a crossbar support, this display stand creates elevation to any potted plant and adds contemporary design to everyday decors. Ideal for indoors or covered outdoor spaces, this stand can hold a variety of large and small potted plants with its 13 inch diameter base. SPECS: Overall - 12.0 H X 15.2 Diameter (in inches). Fits up to 12.5-inch round planter pots. SQUARE LEG PLANT STAND: Decorative modern wooden planter stand with a brown rustic finish. CROSSBAR DESIGN: A center crossbar support and 4-point base create a sturdy stand for heavier garden pots. 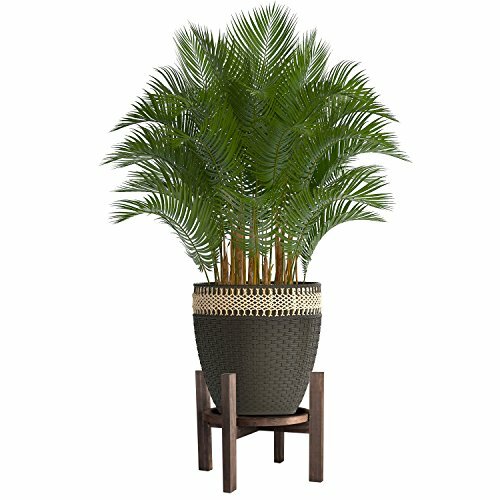 INDOOR USE: Ideal for displaying potted plants indoors or covered patio outdoors. SPECS: Overall - 12.0 H X 15.2 Diameter (in inches). Fits up to 13-inch round planter pots.